New processes for etching aluminium and titanium parts is helping a Shropshire manufacturer smash the £5m barrier for the first time in its history. 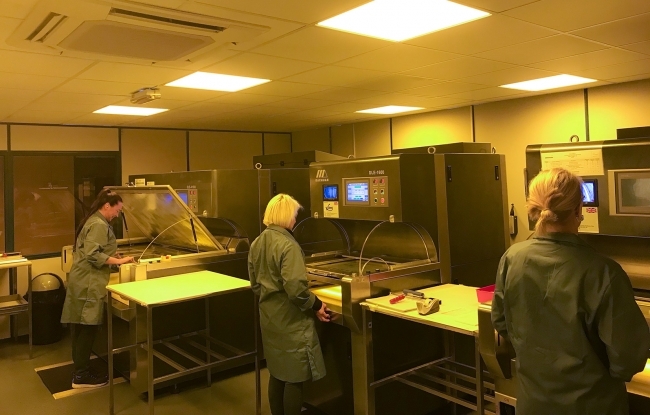 Advanced Chemical Etching (A.C.E), which is located in Telford, has seen sales soar by 20% over the last twelve months, with new contracts secured across the aerospace, F1 and automotive sectors. The firm’s ACmE™ and TiME™ processes have generated significant demand from a global customer base that is committed to sourcing lightweight components. The growth has necessitated the need for 15 new jobs and there could be more recruitment plans on the horizon if plans to hit £8m by 2020 are realised. Ian Whateley, Managing Director of Advanced Chemical Etching, said:“When etching aluminium it generates its own heat, causing the standard etching solution to go out of control…our ACmE™ process negates this by allowing more machine etching time instead of waiting for the solution to cool down back into controllable limits. A.C.E. specialises in development of prototype components, pre-production and volume fulfillment to customers in aero, automotive, electronics, medical, telecoms and renewables. The scope of its activities is far and wide and can include anything from safety critical components for aircraft and F1 cars to meshes and electronic connectors and even frames for designer glasses. All parts are developed and manufactured at its main site in Telford or at the company’s dedicated sister business, ACE Forming Limited, in Kingswinford. Latest production machinery, a dedicated laboratory and state-of-the-art measuring capability ensures it works to the most exacting tolerances and can manufacture components in materials, such as stainless steel, nickel alloys, copper, beryllium copper, phosphor bronze, brass and, thanks to groundbreaking new processes, aluminum, molybdenum, titanium, nitinol and elgiloy. Ian went on to add: “The big investment to date in 2018 has been the installation of three new LED exposure print frames, which give us the ability to image up to 1500mm x 600mm sheets.